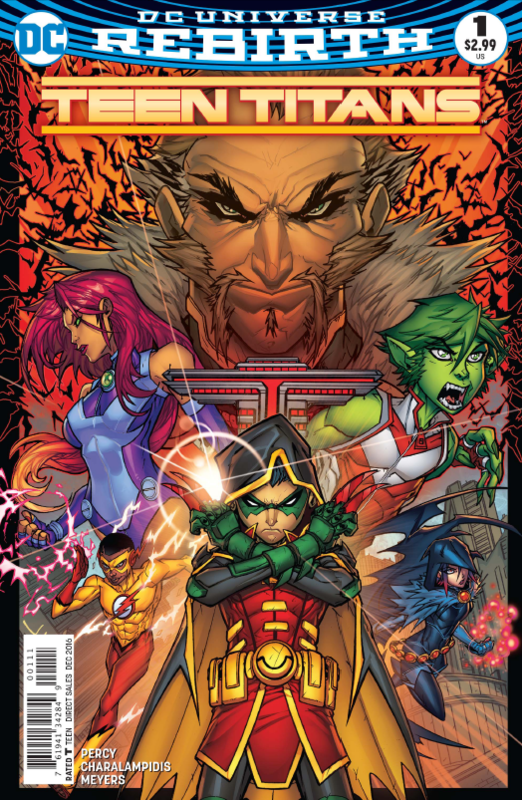 Teen Titans #1 Review – AiPT! One of the newest Rebirth series gets its #1 issue this week and the team is a little different. Actually, it’s not quite a team yet as it’s just forming, but is it good? Ben Percy wrote a fantastic Rebirth issue that drew you in, introduced each character, and even ended with a surprising and compelling cliffhanger. With such a good first issue you have to read this one, right? Happy birthday! Time to reflect. Percy opens this issue with another surprise and this time it’s the fact that it focuses in on Damian aka Robin. It’s his 13th birthday and when he blows out the candles we can guess what he wants. The issue then transitions to where we left off last and serves as a good first issue. You didn’t need to read the last issue to understand what is going on as Percy has Damian explain the relative situation and focusing in on Damian makes this issue feel unique and a good start. Percy has made Damian a focal point for the series, which makes sense since he’s going to be their leader. The issue ends with another cliffhanger surprise that does well to raise the stakes and give the single issue a bookend feel. There’s also plenty of action, moments for the characters to shine through, and some humor too. Damian’s pet bat-beast Goliath makes a healthy appearance and if you’re a fan of Robin: Son of Batman you’ll be grateful for that. Percy even allows Damian to get a bit vulnerable and show the team a bit of his humanity which helps make him feel more than the egomaniacal control freak he’s usually portrayed as. Jonboy Meyers does a great job on art, with Goliath being one of the coolest aspects of the issue. The detail that goes into the chains and belts that make up Goliath’s costume are appreciated and you have to love the detail in its fur and facial expressions too. Jim Charalampidis does a great job giving every panel a pop of color with a neat blue outline effect on the characters that, while somewhat distracting at times, does make the characters pop off the page. You can tell a 3D effect is something they’re after in how they use color, like in one panel that has Robin very vivid and bright and Goliath behind him in a bit of a subdued color palette. All in all, the color does well to enhance the lines and inks of Meyers’ work. Much of the panels are tight on the characters with a close up view of them, which is fine, but there’s a lack of detail when it comes to backgrounds and environments. I found myself getting lost as far as action and where characters were spatially, which made the action a bit chaotic and hard to follow. The color is great, though the blue outline does distract at times, and while it does make the characters pop it also pulls you out of the story as if we’re reading a pop up book. Teen Titans continues to be high energy and deeply fun. The story is rife with surprises and it’s well worth a look of you’re interested in getting a pop in your day.